Your expensive TV badly needs a friend. Weather it's your favorite music video channels or evening soaps on your TV, you feel dissatisfied.The video quality of your TV needs an equally great sound for that complete audio-visual delight you wanted. You have an option of investing in good Home Theater system, but you postpone the idea due to space constraints. Home-theater systems occupy large space with lot of clutter of wires. You wish you had a something that provided equally great sound but is much less expensive and much more portable. 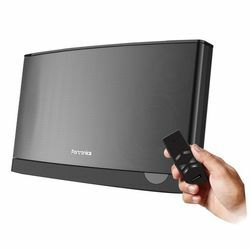 Portronics brings to you the first of its kind high end Sound speaker- the powerful, sleek and robust audio sound system - "SOUNDCHIEF" which has unique features of Bluetooth, USB & AUX-In. SOUNDCHIEF has an exclusive blend of home-theater like sound quality, cool looks to match your TV, much more portable for dance parties, and a great value for money product. its unique acoustic design ensures that you will never miss a beat or a note. Your friends will be impressed when you rock the party with your favorite music. SoundChief is an active sound system with an all-in-one setup giving a super powerful output of 72W from a single sound system and at the same time lends it a more streamlined and compact look. Setting up SoundChief is also a cinch as it allows you a super simple plug-and-play connectivity. SoundChief fits your bill perfectly if you are looking for clean installation and great sound quality. It comes with a Remote Control an absolute essential when you are looking at the comfort of streaming music from "anywhere, anytime!" SoundChief offers a host of useful features like multiple connectivity options of - USB Drive, Aux-in, Micro SD Card and COAXIAL. SoundChief comes with Bluetooth connectivity and gives you the comfort of playing your favourite tunes straight off your Smartphone or Tablet.SoundChief will also steal the show at your get-togethers and dinner parties by allowing you to stream music straight from your computer or other device. The best part is that pairing SoundChief with your audio devices is a relatively simple process.